This post may have affiliate links. If you click one of these links and make a purchase, we will be paid a commission at no additional cost to you. I like to stock up my freezer whenever I know we will be busy and getting dinner on the table will be hard. I also try to “feed my freezer” if I am making food that I know freezes well and that we all like then I make a double or triple batch and freeze half of it. Here are some tips and hacks to make your freezer cooking easier and if you are doing a cooking day, it should run more smoothly by following these. Plan to NOT do anything other than cooking on your cooking day. Laundry will need to wait as well as almost everything else. If this is your first time freezer cooking, start small. Do easier to assemble meals and not as many of them. I would say always make sure to have some easier and quick to assemble meals as part of your session. It’s ended up that these quick to assemble meals tend to be assembled just as I’m starting to wonder if it’s really worth it to be having a once a month cooking session. Do shopping on one day, then meal prep the next and then cooking. Use flat sided mason jars to freeze soups, fruit and other items you would normally put into a ziplock bag to save you money. If space is an issue, then use ziplock bags. Often times you can find cheap pyrex baking dishes at garage sales. 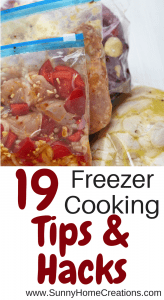 You can stock up on these if you have the room, then use them for your freezer meals. They are reuseable so you won’t be wasting money by throwing them away and needing to buy more like you do with freezer bags. If you are freezing sauces in ziplock bags, freeze them laying down on a cookie sheet. After they are frozen, you can stack them into a box in the freezer to take up less room. If you are using ziplock bags, you can put them into an empty (and clean!) tin can to hold the bag open. It makes it easy to put ingredients in. You can buy disposable foil pans at the dollar store. These are great for meals you are planning to give to someone in need or who just had a new baby. To save money, buy large chunks of meat and cut it yourself. If you’ve been to Costco and looked through their meat section, you have seen these pieces of meat. Make sure to put the name of the meal on the container before filling it. Also, don’t forget to put the cooking day instructions on it as well. Double check your ingredients before you start. It’s not fun to be halfway through the day and realize that you only have half the amount of chicken you need for a dish. Make sure to read through all your recipes ahead of time. Before you go shopping, read through your shopping/ingredient list. Check your pantry for items, check to see if you can find any coupons for the ingredients. Go through the amount of each item you are buying and make sure the format is in a way that you will know how much you are buying at the grocery store. So if you have pounds/ounces for canned goods, break it down into how many cans you need to purchase. Plan your meals for that day. Buy a frozen pizza for dinner that night, prep out your lunch for that day also. The last thing you want is to have to stop on your cooking day to make a meal to eat. Make sure to use up the freezer meals you have made! Like these tips and tricks? I’d love for you to PIN IT! If you haven’t tried them out yet – check out Once a Month Meals here! I use them whenever I am planning to do a freezer cooking day. I have found some awesome recipes that my kids love from them. One of the things I love most about them is I can sort recipes to take out allergens that my kids have. I have one kiddo with a dairy allergy and this has made it easy to find freezer meal recipes that he can eat and still include a variety of different types of meals in it.